After Cody is put on the spot at a memorial service for her best friend, she struggles with being unaware of Meg’s suffering. The 270 page novel by Gayle Forman is a life-examining account of a young person dealing with loss of a best friend and the comfort of life. I Was Here is told from the perspective of Cody, a recent high school graduate from a small town in Washington. Cody is on a quest to sort out the mystery of her best friend Meg’s suicide. Cody wrestles with a myriad of questions and struggles as she comes to grips with being separated from her friend forever. We find out that Meg went off to a university in Tacoma while Cody reluctantly stayed behind and enrolled in a junior college. Time freezes for Cody when she receives a terse suicide note in the mail. The letter incites questions; the answers lead to the feeling of betrayal and disappointment that she didn’t know Meg was suicidal. Cody separates herself from everyone to connect herself with the friends and people Meg left behind. Cody eventually discovers Meg was involved with a online support group which may or may not have something to do with Meg’s committing suicide. She tries to make sense of the disturbing emails and an encrypted file on Meg’s laptop. In the midst of her search, she unintentionally and reluctantly falls in love with someone from Meg’s past. 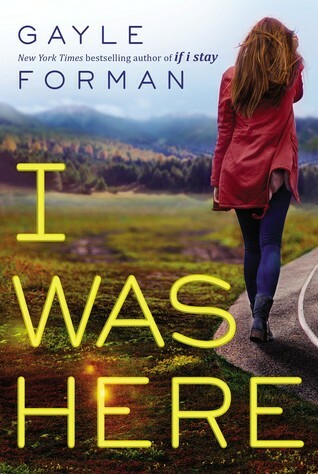 Gayle Forman proves her ability to empathize with the grieving in this mystery, realist novel. I would definitely recommend this book. Some of her notable works include Just One Day and Where She Went. Forman’s best-selling novel, If I Stay, was adapted and released in theaters August of last year. Buy I Was Here on Amazon or Barnes and Noble. To find out more about Gayle Forman and her work, click here.